It’s an unspoken rule – a law in our world – the pregnant world – that you should give into every craving for the 12 months you’re pregnant. Yes 12 months…because for 3 months after you give birth – it’s still ok to wear your maternity clothes without being judged and that means you still can push out your belly in the comfort of elastic. I'm in real danger of looking like this soon. Fat...not a different species...I mean. But, in some case, eating everything in sight isn’t the best thing for you or the baby. Supposedly, you’re not really eating for you two…you’re just supposed to make better food choices and eat foods rich in essential nutrients. Since I’m supposed to stay off my feet, I’ve had to halt my desires to eat french fries at every meal, ice cream after dinner (every night), and hamburgers (with bacon and cheese…with a side of onion rings)…bummer. Lunch – my Dad picked me up and we went to Zen Baking Company. It’s not just desserts, but we have great desserts. But, we’ve expanded our menu to include Asian inspired tapas with a lot of Filipino influence. Today I shared, vegetable lumpia (crispy, spring roll fried to perfection filled with tofu, cabbage, and other veges with a spicy vinegar dipping sauce or the spicy banana ketchup), fresh crepe egg roll (also vegetarian but this one is a housemade crepe filled with green beans, sweet potatoes, and other veges that have been slightly sauteed and topped with a peanut sauce), and I took a bit of my sister’s field green salad tossed in a balsamic vinaigrette topped with miso glazed salmon bites. YUM! Dinner – this was a throw together meal. I got home late and didn’t know what we were having. I saw the mac and cheese and thought maybe mac and cheese for everyone. But, I found pork chops in the freezer, saw the potatoes and the stir fry vege pack and decided to make grilled pork chops with thyme and a little bit of lemon, mashed potatoes, and steamed vegetables….and mac and cheese since it was already on the stove. Overall – a pretty good eating day. Nothing too bad for me and all in moderation. High fives all around. 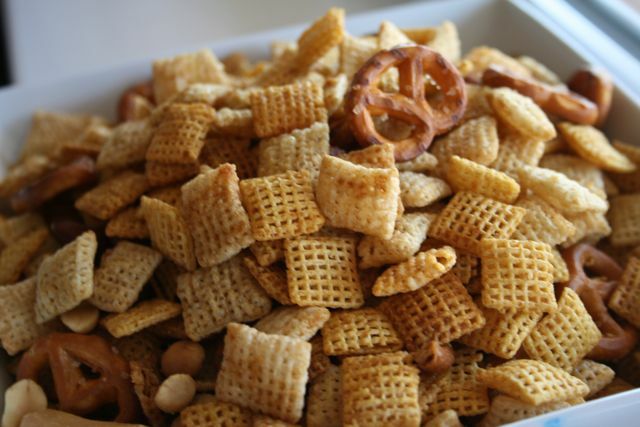 Addendum #1 – I forgot that I also might have had a bowl of Chex Mix. But, that’s it. Addendum #2 – Ok – honest mistake – I was working on potty training and we reward Iz for going pee pee in the potty with M&Ms. I wanted to set an example so I went pee pee too…so I got an M&M…or a handful…what…I wanted to see if they would melt in my mouth and not in my hand. Addendum #3 – FINE. I didn’t skip dessert. But come on – how do you say no to a chocolate chip cookie ice cream sandwich. That’s right…you don’t.